MystereBooks is pleased to feature Quinn Checks In by L. H. Thomson as today's fifth free mystery ebook (A Liam Quinn Mystery; Kindle format only). This title was listed for free as of the date and time of this post, February 28, 2014 at 7:30 AM ET. Prices are subject to change without notice. The price displayed on the vendor website at the time of purchase will be the price paid for the book. Please confirm the price of the book before completing your transaction. Ex-con and art forger Liam Quinn is back in Philly, up to his neck in miffed family members, suspicious police officers and a best friend he's secretly crazy about — and who may or may not feel the same. 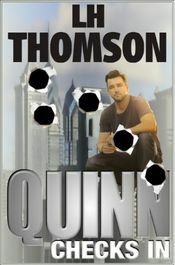 His old man — a veteran cop — has pulled some strings, landing Quinn a job as a freelance insurance investigator. When a gallery heist isn't what it seems and crooks start returning stolen paintings, Quinn starts running out of people to trust. The biggest mobster in town, a sweetheart named "Vin The Shin" is calling him out; a steady string of lowlifes want his head, and the local police think he's hiding something. But hey, when trouble comes knocking? That's when Quinn checks in. This is a repeat freebie, last featured on this site on December 22, 2012.